Two first-timers won the Elite classes of the Finnish Open. One of them Estonian! 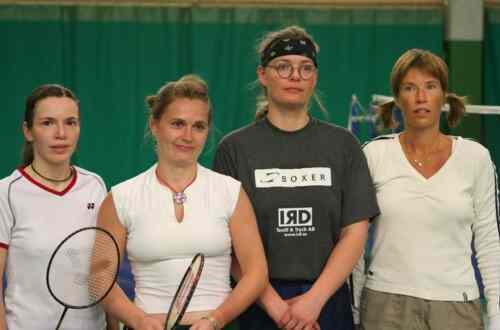 Kati Kraaving played her first racketlon tournament in Gothenburg 2002, where she became second in the Ladies' Amateur class (see results), and has apparently improved since then... In the semi-finals she beat World No.1 Druve comfortably +20 (14-21, 21-10, 21-5, w.o. ), she has now moved up from No.18 to 6 on the latest World Ranking ...and she is coming to the Worlds. With 9 out of the top10 on the Ladies' World Ranking having signed up (see entry list) and at least one outsider (Former Mixed Doubles Commonwealth badminton champion Chan from China, see recent article) the Ladies' Class is looking more uncertain than ever (assuming the absence(?) of Scotland's Sarah McFadyen). Eliasson vs Kärkkäinen. Dominating the sport since 2001. Will they meet again in the World Champs final? I'd say yes. "Squash was the only sport that went reasonably well" said a disappointed Mikko Kärkkäinen after having lost the final. Magnus Eliasson, on the other hand, had prepared well for the event and was all smiles and said he valued the victory in Lahti even higher than a World Championship gold. Previous attempts in Lahti had been poor for Magnus and this victory tasted extremely good. Thirteen points in table tennis and a strong performance in badminton smoothed the way to victory. In badminton Mikko didn't get his normally so active attacking game going. Squash went evenly to 16-16 with Magnus taking the rest of the points. John O'Donnell, who was refereeing, had difficulties in controlling a sometimes aggressively playing Magnus. In tennis Magnus was controlling from the beginning with good serves and controlled strokes. The match ended 18-12 with Magnus "jumping of joy". In the bronze-match Rickard Persson played John O'Donnell, who performed well throughout the event. John started very well and got 15 point in table tennis. Rickard then kept the match alive by doing well in badminton and squash - perhaps the weekend's matches started to take their toll. 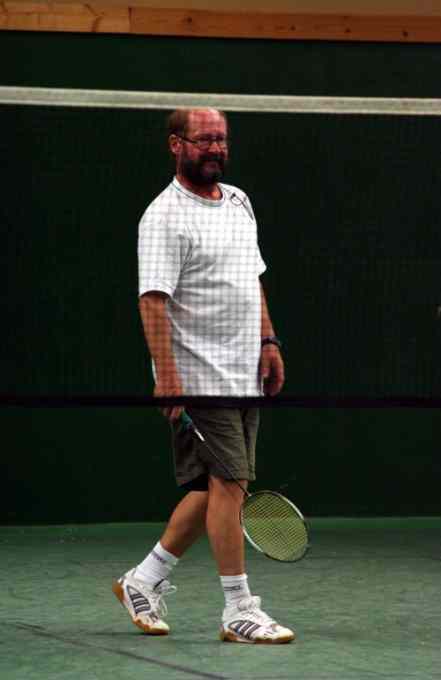 In tennis at 3-0 John injured his leg and he decided not to continue the match. With regards to the World Championships in Belgium coming up in just two weeks it is hard to believe that anybody else than Eliasson and Kärkkäinen can reach the final. Kati Kraaving. 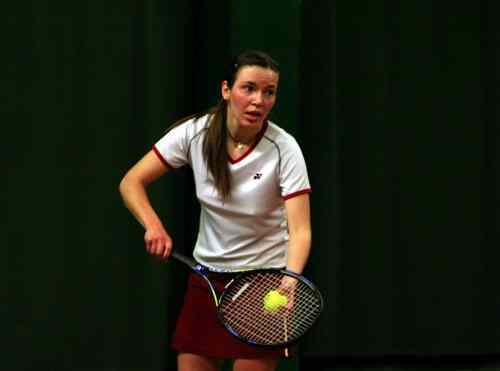 Estonian doubles champion in badminton. The women's final was surprisingly played between Hanna Miestamo and Estonia's Kati Kraaving. The final was a match between to fit women and it started with Kati winning the table tennis 21-15. In badminton Kati (Estonian doubles champion) was showing good form and made Hanna move around the court and only lost four points. The running in badminton surely took its toll on Hanna in squash, which she won 21-14. The "fitness-miracle" of Estonia needed only six points in tennis and her first World Tour victory became a fact. Susanna Lautala-Näykki beat Lilian Druve in the bronze-match. Susanna's strong tennis finally decided the match. In light of Lahti there will be a new World Champion in Belgium. World Class. Kraaving, Miestamo, Lautala-Näykki, Druve. Runner-up David Greatorex, England. Controlling badminton. Harri Peltola and David Greatorex met in the men's 45 final. Harri was not pleased with his table tennis while David showed good form and took fifteen points. The Englishman was moving well in badminton and controlled the game giving Harri, a good badminton player himself, fifteen points. Surprisingly Harri won the squash 21-14 and got a seven points lead before tennis. Serving decided the match. Harri served well, David didn't and this gave the man from Nastola one more victory. 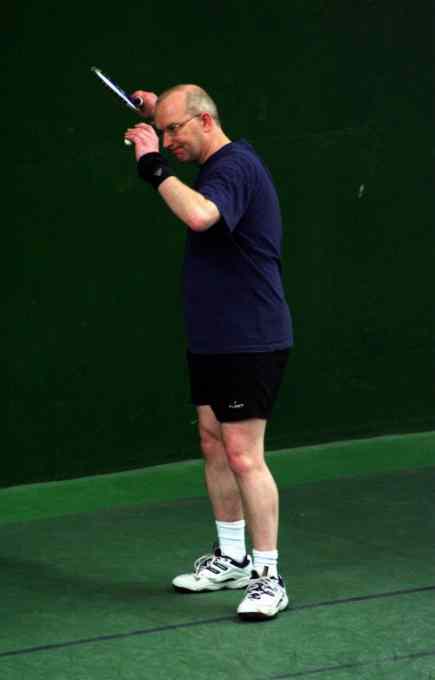 The bronze-medal was won by Anders Lundström, twice Finnish Racketlon Champion (1999-2000), who has come back to the game. He beat a real gentleman and an excellent sportsman Claes Hellgren from Sweden in the bronze game. The M55-class was played for the first time in Finland. The winner was, as expected, Sten Lindström. "Stena" is good for anything in Belgium, he is fit and his game is good. Silver was won by Risto Kumpulainen. The winner of the men's B-class was Teemu Sainio. Antti Jääskeläinen of Lahti, winner from the two previous years, had to give up after badminton with an injury. The bronze went to Jarmo Vilhunen who could have played in the M45-class. The men´s C-class final between Estonia's Toomas Vallikivi and Finland's Tuomas Perkkiö was full of drama and was finally decided by gummi-arm. The winner was Tuomas from Oulu. Yrjö Solla. Multiple year co-organiser of the Finnish Open.